Jason Saves the World: Zombies in the Desert! 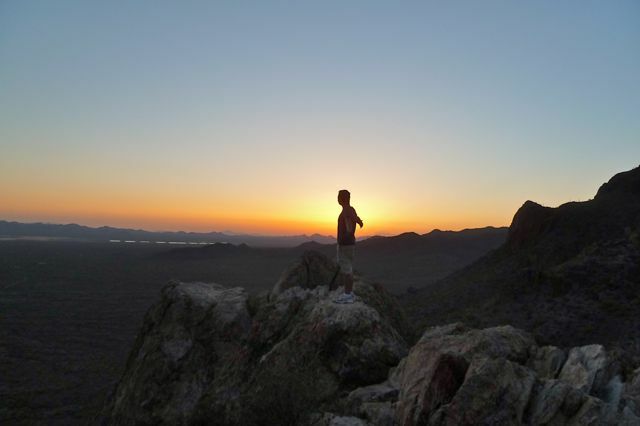 Tucson is Arizona's second city, if you will, often overshadowed by the much larger Phoenix. 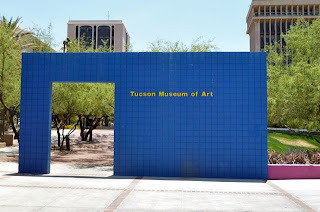 However, unlike Phoenix, Tucson seems to retain a good deal of its history and has a fledgling artist/alternative community, fostered in no small part by the presence of the University of Arizona right in the center of town. The day started with breakfast at our hosts' place, homemade breakfast burritos. Ashley and Trevor had tickets to a playoff softball game at the U of A, so as they left for that, Ueli and I headed out to explore the city ourselves. It was hot, as one might expect from the Sonora desert in late May. 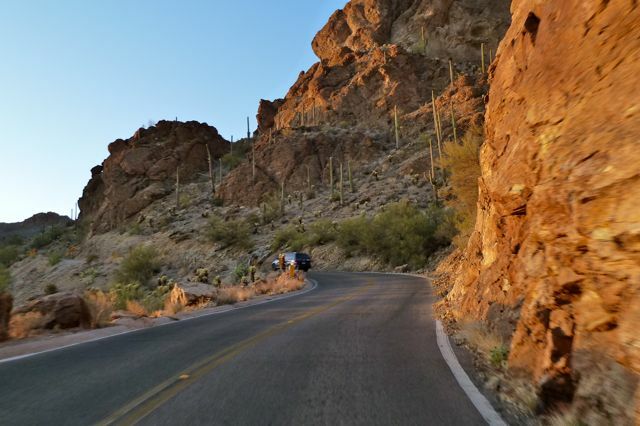 We drove into downtown Tucson, dropped off some postcards at the first mailbox we could find, and then drove toward the Presidio, a historic part of town that seemed worthwhile to visit. But again, it was completely deserted. There was no one else walking around. There were a few people hanging around like hobos in the plaza near city hall. 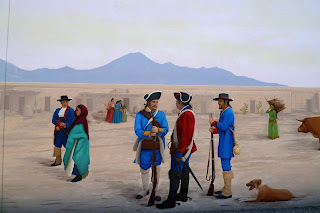 We walked around, saw some government buildings and then discovered the original pueblo settlement built by the Spanish in 1775 or whatever. The general history of Tucson is almost the same as the history of any city in California: It was settled by the Spanish, who tried to convert the natives to Christianity, then it became part of Mexico during their independence, and a couple decades later was made part of the U.S., and the city really began to grow after the railroad came into town in the late 1800s. Downtown Tucson was historic, but the midday sun was beating down on us so strongly and the area was so empty that our visit to the area was really unspectacular. So, we drove toward the more happening part of town, 4th Avenue (full of bars/cafes/restaurants) and the university area. 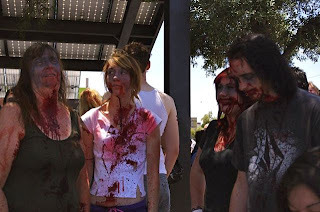 When we parked the car, we noticed that there were many people on the street walking with their faces and clothes shattered with fake blood. Maybe they were making a statement about surviving yesterday's "Judgment Day"? I asked one of them what was going on, and she told me that they were filming a movie, a "zombie comedy" called Copper Creek, that was to be released this September in a local theater, stopped by Jamba Juice to get our sugar and hydration on, and then wandered onto the U of A campus. Since school's out for summer, the campus was really empty too. The buildings were all closed, and we'd only see a person here and there walking around. If people were around, I could imagine this university being a nice place to study (in the winter, when the temperatures are much more bearable). After walking around campus, we walked back to 4th Avenue and took in the sights. We stopped into a Goodwill to cool off, and then we went to Lindy's on 4th to try one of their famous burgers. Lindy's is a burger restaurant that was on the TV show Man vs. Food, in which Adam Richman devoured a 12-patty burger in under 30 minutes (their "OMG" challenge). Ueli and I were not that hungry, so we simply split a mac n cheese burger. It was good, but it would've been better if they used homemade mac n cheese instead of store-bought Kraft mac n cheese. It was the middle of the afternoon, and the burger and baking sun had made Ueli and I quite drowsy, so we drove back to the house and napped. It was about 6pm when I awoke. We decided to go somewhere to see the sunset, and there were two options: Gates Pass and Mount Lemmon. We flipped a coin and decided to go to Gates Pass. We drove with the windows down, the air still very warm but the sun tempered by the lateness of the day. We arrived there just after 7pm (having originally driven right past the parking lot and into the wrong vista point). But when we got out of the car, Ueli immediately decided to climb up the side of the mountain and began sprinting ahead. 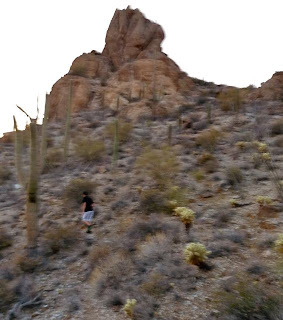 I was like, "ok, we'll just climb to that small ledge over there." But Ueli pushed onward and continued hiking uphill. We ended up climbing over 3 peaks to the highest accessible peak. Just like James Franco in 127 Hours (before he fell down a canyon and was crushed by a rock). Soon, I was out of breath. It didn't help, either, that (bad joke alert) the view all around me was breathtaking too. It was windy atop the mountain peak. If I weren't so sure that I was on solid rock. We watched the sunset. We hiked back down somewhat quickly as well. We drove back, windows and sunroof open, blasting our newly created mix CD. We stopped by Del Taco to get some cheap eats for dinner.